Leslie, unless a beader has been living under a big beaded rock, they will know your name! When you're not creating specifically for a magazine or company, how do you describe your own work? I’m definitely best known by my own name as a seed beader and from doing TV shows. I have a geometric approach to design. 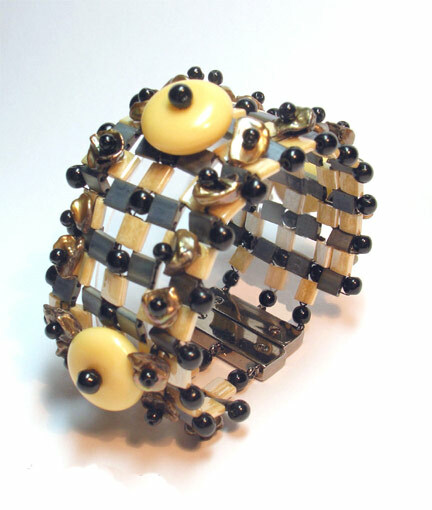 I'm also recognized for my use of rubber O rings and rubber tube, industrial ephemera as well as Swarovski crystal elements within my designs. I’m getting great feedback for my method of drawing out bead diagrams right in front of you, I call this "Doodlebeads" and I have DVDs which use this method to teach basic seed bead stitching. 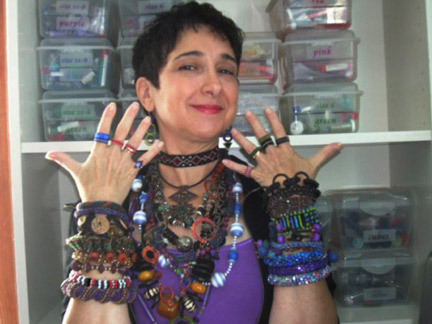 I use my name because I appeared on the bead scene in 2005 as the editor in chief of the now defunct Step by Step Beads, and people know me from that as well as my contributions to other magazines from many publishers. But I also have the name Sleepless Beader linked to me from my Etsy shop and blog—a name that is trademarked. My blog and Etsy shop are called Sleepless Beader ™, which says a lot about my working hours! I am most inspired by playing with a mess of materials, mixing and matching, stitching and cutting apart… trying various things, an endless process for designs. Though I rarely draw actual designs first, I do keep a sketchbook and will draw shapes or jot notes for styles and looks that grab me, be they textural (clockworks) or just notes such as "think medieval banners." And, I have the TV on almost all the time, listening to reruns of favorite shows. I also listen to show tunes more than anything else, keeping up with my daughter who is a musical theater major in college. I hold a degree in illustration and design from the University of the Arts. This formal training definitely helped hone my visualization and conceptualization skills, and most definitely gave me the craft to develop my Doodlebeads illustrations. Also I grew up around artists and always the arts since childhood. I started out to become a childrens' book illustrator. I have sketchbooks filled with fantasy illustrations and always loved to draw. I evolved into fabric art by teaching myself how to sew because I couldn’t find clothing I liked that I could afford! I created fiber sculpture and also had a line of wearable art which I marketed through the ACC and Buyers Market Craft shows. So I have a lot of experience in many things that all contribute to what I do now. I know I could make art from any materials. But I must say I'd miss my computer the most, since I work from home, which can be isolating. I love having the world as my library on my desk! The materials themselves give me ideas for bringing things together in final forms, but certainly specific historic eras and objects inspire me: medieval, tribal and ethnic arts, medallions and insignia, steampunk, the color black, metallic surfaces, Cirque-du Soleil, futuristic shapes, almost anything. I'm not a very flowery or frilly artist, I have to say. I love organic forms especially aquatic, but seem to need more control over my work. Symmetry is my inclination more than freeform. I have many projects going at once, so can put something down and work on something else for a while. I never have a total block, ever. Keep honing your technical skills, keep learning new skills, and definitely find your OWN voice. Stick to what you like, I don’t care what people say about stretching by using colors you don’t like and all that. Make what you’d wear yourself or find a muse to design for. Pay attention to what catches your eye and ask why. AND BUILD A GINORMOUS STASH. If you have only one toy and it gets used up, what then? Won’t you get bored? MARKETING. Maintaining my online web site, FB pages and Etsy shop. Blogging. 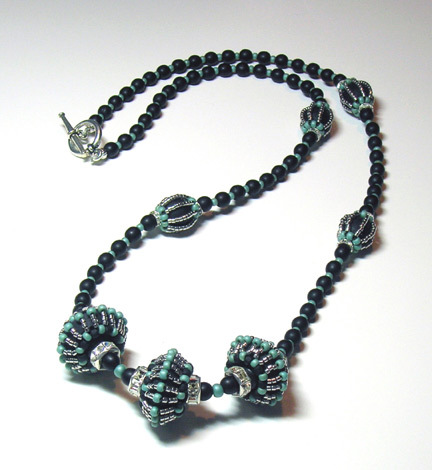 Travel for TV shows including Beads, Baubles and Jewels, and Jewelry Television. Running a business is a huge part of my life outside just making the art itself. And of course my real priority: my family, friends, and being a stage mother! 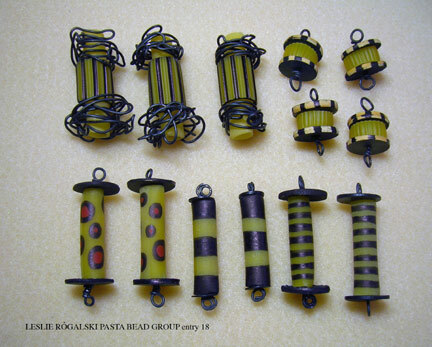 Much of what I do as a working bead artist is for industry clients, using their products, teaching how to use their tools, featuring their specific components. I LOVE the challenges of all this, and it makes me reach beyond what I would otherwise, so it's a great, fun ride, no question. My sponsors are the best. I love being on the TV shows on their behalf and enjoy a wonderful working relationship with companies for instance as a Beadalon Design team member and a CREATE YOUR STYLE with Swarovski Ambassador. But if I could spend my days making only what I wanted … with the materials I love best. SIGH. That would be a dream life. What's your favorite comfort food, book, and other favorite things? Salty pretzels, coffee, martinis with lots of olives. Law and Order. Star Trek TNG. LOTR, and Pirates. Classic old movies. I'm also a major Disney World freakazoid and would visit as often as possible if I could afford it. I like to tap dance. But for beading time: Broadway tunes, TV and movies: I adore fantasy and sci fi, especially really bad movies with giant, genetic mutations of snakes, sharks, gators, etc. Perfect beading movies! 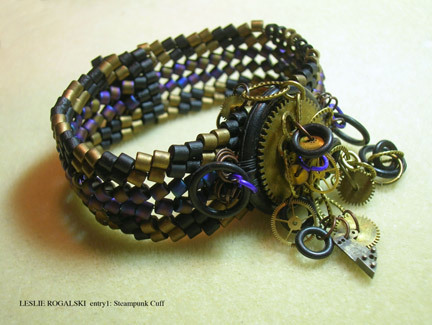 Leslie Rogalski is one of my favourite people in the beading world. Great interview! Great beadwork and nice interview! I love Leslie's funky cuff bracelets! Pasta beads? Whoever would have thunk? Love the pasta beads. Nice interview and very interesting person. what a cool interview -- I have always loved Leslie!